In the aftermath of the presidential election, some vendors at outlets like CafePress and Zazzle are starting to shift their marketing strategies to keep capitalizing on bitterness and hatred. They are starting to discount their racist, anti-Obama bumper stickers and swag denigrating “other” types of people. 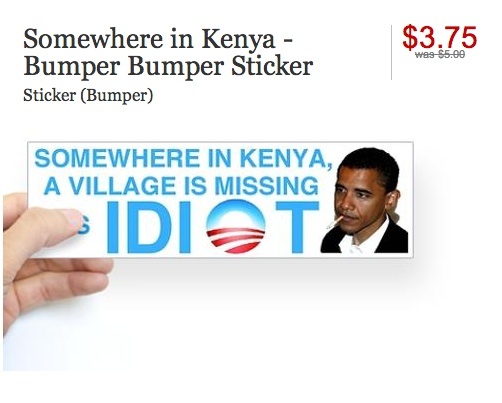 The price of a sticker featuring a photo of President Obama that says “Somewhere in Kenya, a village is missing its idiot,” for example, has been cut from $5.00 to $3.75. But merchandise exploiting the battered emotions of the millions of angry, racist and hyper-religious people who lost the election is starting to appear, and it’s not cheap. 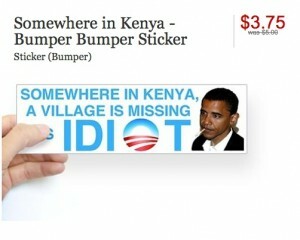 A pack of 100 refrigerator magnets that yelp “Obama Won, America Lost! Nation in Distress — Only God can Save Us” is going for a whopping $200, and a 50-pack of stickers with a graphic that depicts the phrase “No White Guilt” is selling for an insane $140.00.